Published in the South Kent Gazette, 20 May, 1981. The mention of this green mead—a rendezvous for sport and pleasure—wakes up various recollections. This place was the locale of the last phase of Charlton Pair; here Association football was first played in Dover; and on the sward which flourished here, on Easter Sunday 1894 Colonel Stirling’s Brigade of London Volunteers held a drum-head service in the presence of an enormous military and civil concourse, forming probably the most impressive scene of its kind ever witnessed at Dover. Another change worth recording was the laying out of the Barton riverside path in June 1893, due largely to the advocacy of Alderman George Birch. From ancient time there had been a path from Charlton Green, past the church, and round the farm boundary into the Barton Road, and this was extended along the river bank up to Cherry Tree Avenue, forming a pleasant public walk. The streets and terraces which were built along the Barton Road soon became one of the largest and most pleasant suburban residential districts of Dover. On approaching from Frith Road, at the junction with Connaught Park Road and Castle Avenue, the first building is the old Charlton Girls’ School, built in 1882, enlarged in 1898 and later a mixed infants’ school. Next is what used to be Messrs Clark’s Nurseries, with a pleasant frontage which had extensive glass houses and propagating grounds in the rear. Parallel with Barton Road, on a higher level, eastward, is Heathfield Avenue, containing about 82 houses; and, higher still, another parallel road, called Mayfield Avenue, containing about 108 houses. From the north down to Nightingale Road, is the freehold part of the estate, comprising about 350 houses. Below Nightingale Road, the building land is leased from the Ecclesiastical Commissioners, for a term of 999 years. On the south-western side of Barton Road, where formerly stood Barton Farm, with the exception of some reserved plots adjoining Barton Road, the whole of this land was absorbed by various builders and covered with houses, arranged in four roads, called Beaconsfield Avenue (a continuation of the line of Beaconsfield Road) and Charlton Avenue, extending from the river path to Barton Road, the latter passing over the actual site of Barton farm house. Another, parallel from the river path to Barton Road, is called Limes Road; and the remaining portion of the land, up to the boundary of the schools, is allocated to a short street, called The Grove. On this riverside part of the Estate, there are about 106 houses. Immediately north-west of this new property are what used to be known as Barton Boys’ Schools. These were opened in-January, 1898, provided to meet the requirements of the parish of Auckland. The plans were drawn by Mr J. Cresswell (of the firm of Cresswell and Newman), to afford accommodation for. 440 boys, and built by Mr W. G. Lewis, the cost being £3,500, £1,800 of that amount being contributed from a fund raised by the Dover Schools Managers’ Association, and £200 by the National Society. This school has since been purchased by the Corporation of Dover. Further north, is another school, built in 1902, for infants, by the Dover Church Schools Company, and that has since been acquired by the Corporation. These two schools are built on the land which was known as Barton Meadow. The remaining portion of Barton Meadow, up to Cherry Tree Avenue, was, until some time after the last war, occupied by St Barnabas Church and parish hall. The latter, which was built next to the schools, was a long building of corrugated iron, on a brick foundation, used for the Sunday school and parish meetings. The church was commenced in the year 1901, the memorial stone, in front of the chancel, being laid by Mr Robert Hesketh Jones, JP, on the 9th of October in that year, the plans having been drawn by Mr B. Ingelow, architect, and the building was done by Mr R. W. Paramor, of Dover. The first portion that was built consisted of the chancel, the sanctuary, part of the north aisle, and the first bay of the nave, giving a depth of 48ft and a width of 21ft. The cost of the permanent work was £6,130 4s. 7d, and when the church was opened for worship, in the following year, about £3,000 of that was left as a debt, towards which about £1,000 was soon raised. The original fund by which this church was built was £1,800 from the Marriott Bequest and £1,200 raised by subscriptions. 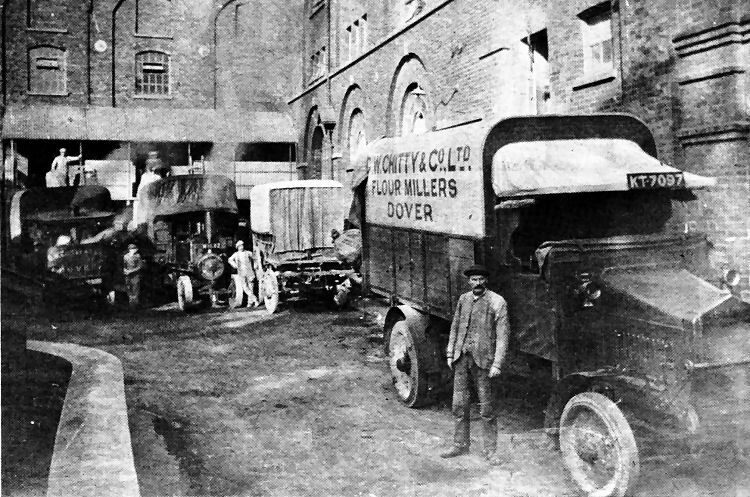 A familiar sight in Barton Road at the end of a day’s work about 60 years ago were Chitty's flour mill lorries and wagons heading back to the mill oft Charlton Green. Here two of the Foden steam powered lorries are getting steam up for a day’s work. At that time a Hallford motor lorry was also fn use and behind it is a horse-drawn wagon. Standing by the lorry on the right is Mr Fred Payne. 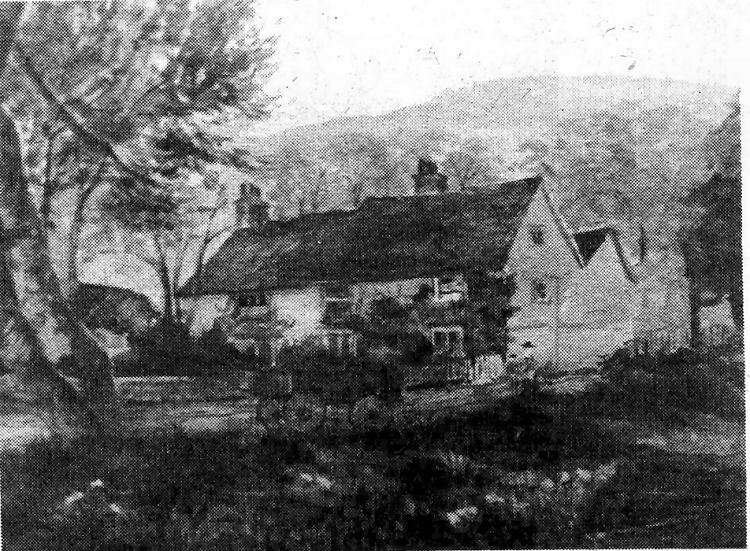 The picture, above, is a painting of Barton Farm which stood near the river at the bottom of what is now Beaconsfield Avenue, and is viewed as it appeared looking towards the hillside above Barton Road.